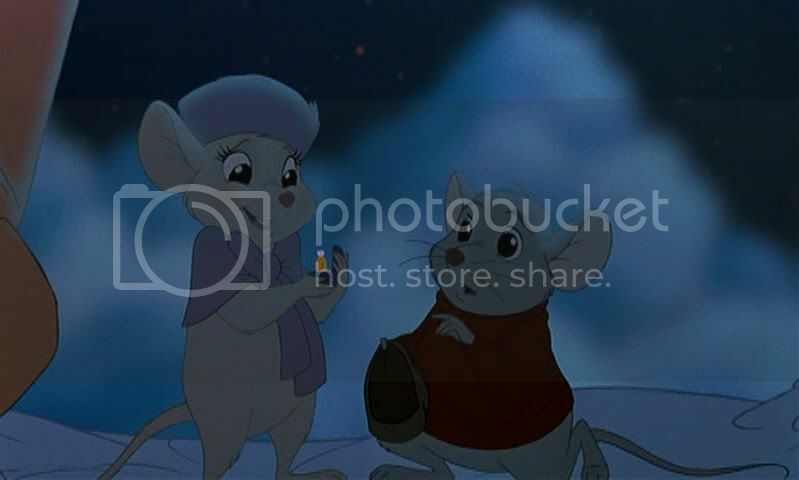 The Rescuers Down Under was always one of my favorite Disney films growing up. 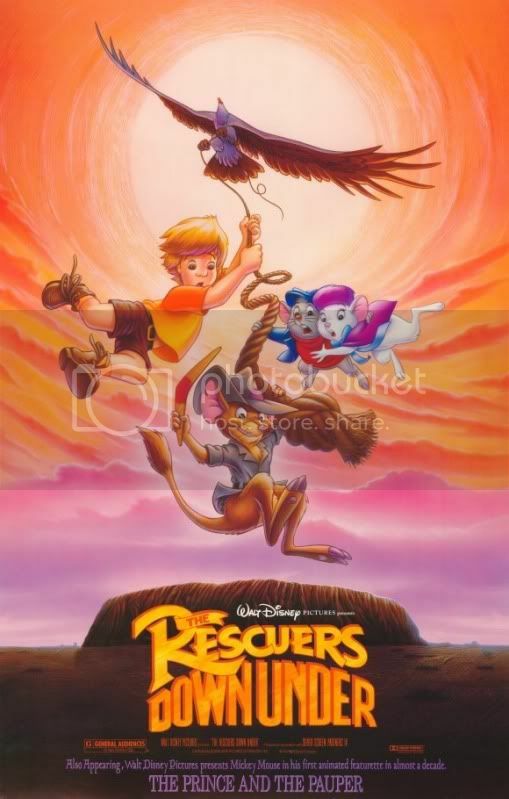 It took me many years to realize that it was supposed to be a sequel to The Rescuers, a film that had frightened me due to a terrifying crocodile. The Rescuers Down Under, on the other hand, featured a boy exploring the vast wilds of the Outback alongside his animal companions. Growing up I had plenty of land to explore, though none of the animals ever spoke to me. It is remarkable how many of the characters remained vividly in my head, even though I hadn’t seen the film too many times since childhood. Bernard (voice of Bob Newhart) and Bianca (Eva Gabor), though the stars of the show, are the plainest of the bunch. George C. Scott is terrifying as the evil poacher McLeach. His quest to find the rare Golden Eagle sets the story in motion. The Golden Eagle herself provides some of the most memorable sequences. After our hero, the young Cody (Adam Ryen), goes exploring in the Outback one day, a kangaroo friend informs him that a great bird has been trapped. 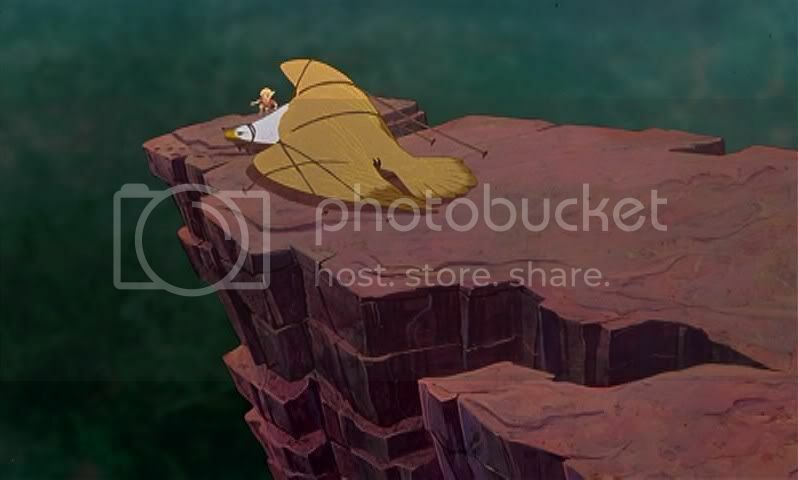 Scaling a 5000 foot high cliff is no problem for Cody, and once he reaches the summit he finds the giant yellow eagle. The ensuing rescue and flight through the jungle and clouds is a highlight of the film. Cody, on his way home after a good day’s work rescuing animals, falls victim to one of McLeach’s traps. McLeach decides to kidnap the boy in an attempt to find the Golden Eagle. Cody’s forest friends, however, send a distress signal to the Rescue Aid Society in New York, where Bernard and Bianca are sitting down for a romantic meal. Interrupted in his attempt to propose to Bianca, Bernard finds himself scurried away on an immediate trip to Australia. 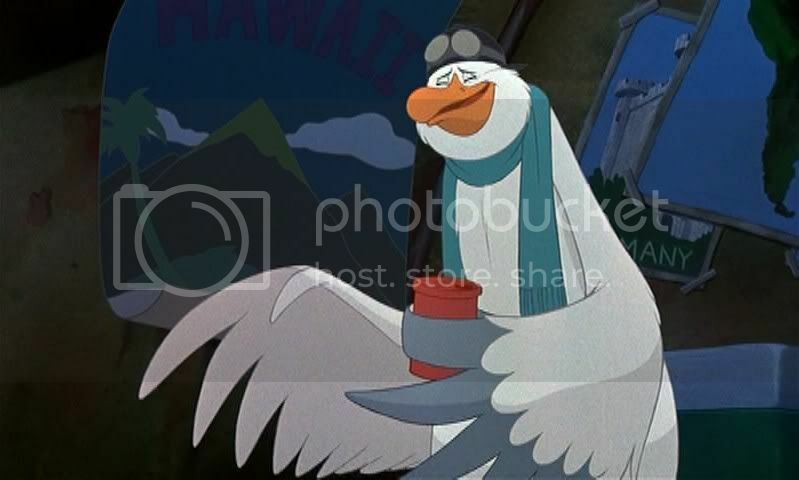 Their means of travel consist of one very large bird, Wilbur the Albatross (John Candy). As he finally skids them into their final destination, they are greeted by a friendly kangaroo rat named Jake (Tristan Rogers). His eyes alight on Bianca, ensuring that he will be willing to help them on their adventure. All of the supporting characters are unique, including McLeach’s pet reptile Joanna. Frank, an odd lizard-like creature Cody encounters in McLeach’s lair, provides some of the biggest laughs due to his brain not being quite right. A rat doctor that examines Wilbur’s back pain after the flight is also amusing. The story is fairly standard, and there are no musical numbers that other Disney films would later boast. The sense of wonder and adventure makes up for it as Cody explores the gorgeous Australian landscapes. A mixture of hand drawn animation and CG backgrounds provide some thrilling moments as the camera zooms above the Outback and through the clouds. There are some elements that don’t quite make sense watching the film as an adult. Cody’s mother has a bit of a British accent. Cody himself is purely American (I wonder if they changed it when they localized it for non-American audiences). Scott’s growling McLeach also sounds decidedly American. Jake is about the only character with a true Australian accent, channeling as much of Paul Hogan’s Crocodile Dundee as possible. 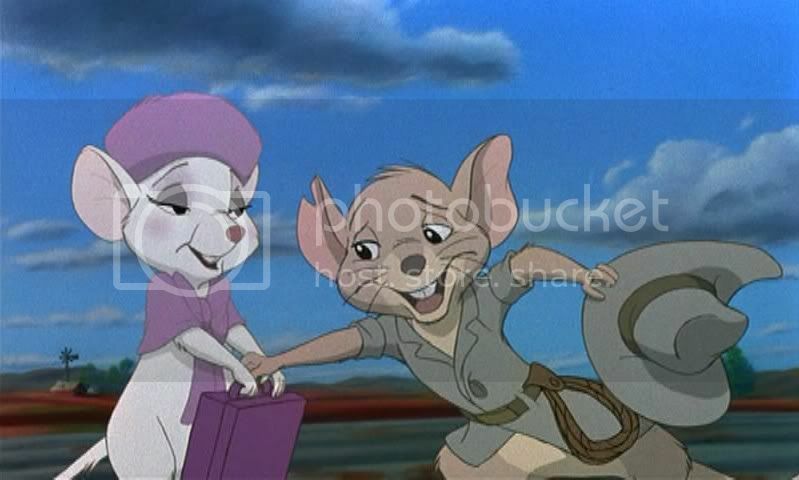 The Rescuers Down Under is not one of Disney’s best films, but its memorable characters and exciting landscapes hold a special place in my heart. Its use of CG landscapes proved to be a first for Disney films; whether that change was for the better or not might be argued in certain circles. Overall, Disney’s first animated sequel is a fun experience, and a film I won’t mind watching with my children someday. This entry was posted in 2.5 pirate flags, 3 stars, Movie Reviews, R on January 10, 2010 by Tim Irwin.